McMillan is planning the future of the Adult Room. It has changed little since 1970 and needs to be updated to meet current community needs. The planning process involves community input, including a survey and workshops. The flooring in the room dates from 1992 and is in need of replacement. If all the furniture is moved out of the room for that, we don't want to put it back where its been for nearly fifty years. To help us explore options, the Library Board has selected Engberg Anderson, one of Wisconsin's top library architecural firms. To gather community input, McMillan has prepared a survey. While we are already using the results, more comments are welcome. Workshop Two was on February 13 and included preliminary designs and a chance to develop design concepts. Read the Workshop Two Report. Workshop Four was on April 10. In this presentation, the overall design for the adult room was presented including possible incremental steps within the context of an overall schedule that will allow the design to be implemented in a rational manner. Cost estimates for the final preliminary plan are included. Read the Workshop Four Report. 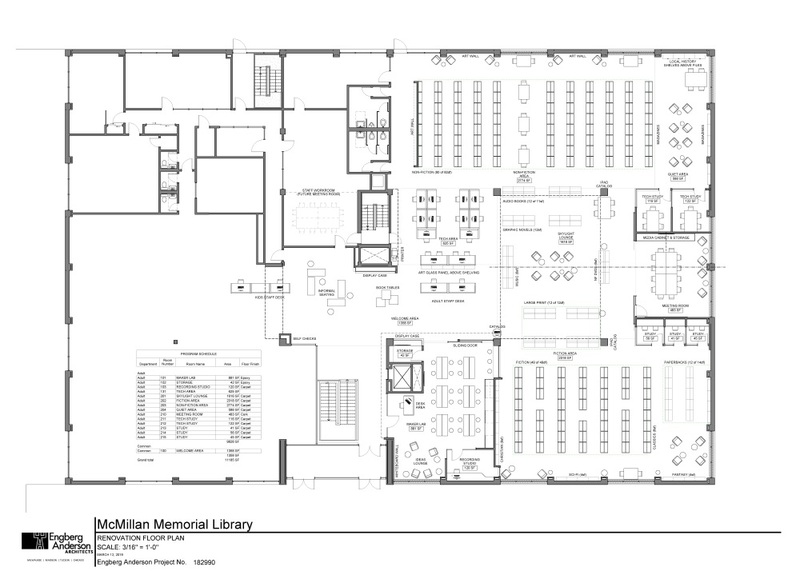 A final report will be presented to the Library Board on May 1 at 5:00 pm in a public meeting.